Amy Adams squeezed her toes into a pair of way too tight shoes at the 2019 Oscar Nominees Luncheon at the Beverly Hilton Hotel in Beverly Hills, California. She is nominated for Best Supporting Actress this year for her performance in Vice, a 2018 American biographical comedy-drama film. The 44-year-old American actress donned a forest-green Oscar De La Renta dress, Christian Louboutin‘s Uptown Double shoes ($895 at Barneys), and Azza Fahmy chandelier earrings. Her tortured feet looked red from pain. How was she even able to smile? 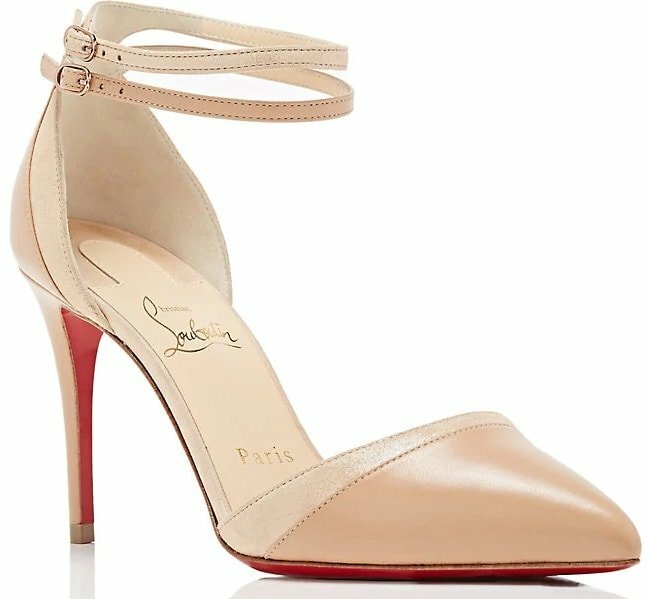 Crafted of beige nappa leather and suede lamé, Christian Louboutin’s Uptown-Double pumps feature a pointed toe and a leg-lengthening stiletto heel. This understated pair secures at the ankle with slender crisscross straps. A few days earlier, she also stunned at the 2019 Screen Actors Guild Awards in a black strapless pleated tier Celine dress styled with Jimmy Choo shoes and Cartier jewelry. Amy was nominated for Outstanding Performance by a Female Actor in a Supporting Role for her role in Vice and for Outstanding Performance by a Female Actor in a Miniseries or Television Movie for her role in Sharp Objects.